Obviously shrink wrapped in plastic. Weird. Thanks Kate! With imagination, It looks like a cross between a Notheastern storm after the snow settled, and or a river bed.....beautiful pic. Notice how FEW craters are on the surface! Speaking geologically, that's a young surface. I wish we could just orbit that sucker for a while and observe the changes that are happening there. The flyby on Halloween is more about imagery, this one was to get it through the plumes. Although to what purpose I am unsure since it really doesn't have sensors to sample the particles. Although a close look is pretty cool! Enchilada, corn tortilla, moon, named by a spelling bee flunkie ? I wonder why these photos are black and white. You would think that NASA, boasting of its state-of-the-art technology could figure out how to take high resolution color shots in space . As for the strange geologic features ..has anyone heard of Electric Universe Theory..it explains everything quite clearly. Google Thunderbolts and follow the EU links. What great view. I can't wait to see more pictures. Keep going Nasa. Betcha there's dinosaurs there! That's where God hid 'em. Shai, the pictures are streamed back in different exposures and need to be colourized based on a rather complicated process. http://www.spacetelescope.org/projects/fits_liberator/improc.html Even the spectacular images we get from Hubble look black and white when we first get them. Depending on the object, the spectra involved, and such, it can take quite a while to get the "colour" image out. Something else to keep in mind, there aren't a lot of colourful object around there to start with. Snow/ice tends to be rather monochromatic. As for the Electric Universe Theory... Seems an unnecessary spiritualistic view attached to science. Trying to assign some sort of meaning where there really is none. Amazing photo. I'd like to see a little more interpretation. Are we looking at rock or ice? Or both? What is the scale? "This raw, unprocessed image was taken during Cassini's extremely close encounter with Enceladus on Oct. 9, 2008. The image was taken with the Cassini spacecraft narrow-angle camera on Oct. 9, 2008 a distance of approximately 42,000 kilometers (26,000 miles) from Enceladus. Image scale is 503 meters (1,650 feet) per pixel." Franko's comments always make my head hurt. I don't recall him ever making good sense. Larian: Even on a geological scale, we'd have to orbit Enceladus for thousands of years to notice any appreciable change on its surface. We might notice some small changes in the course of decades or centuries, but I am willing to bet we'd need a hugely powerful, ultra high-resolution spacecraft for something like that. Tiger Stripes indicate convection, water, not far under the ice cover. Submarine to the core, to spy the bottom feeders. Black Smokers ? Giant jellyfish colony from Jupiter ? Did they invent space travel ? Helium 3 , other radioactive energy sources, just waiting to be core picked ? Pluto center pressure ~ 10 e3 Atmospheres ? Scuba diving in 70 meters Earth equivalent pressure ? Perhaps a good mini, atomic battery powered, submarine. Must be Gold in the core ! The Enceladus Gold Rush, here we come. That long crack looks like a river may have flowed through it. Let's create a billion dollar mission to see if life once existed there...NOT! The lack of craters does indeed indicate a GEOLOGICALLY young surface, but we're talking MILLIONS of years, not years, old. However, changes have ALREADY been observed: surface temperatures along the Tiger Stripes have varied from flyby to flyby. As far as liquid water convection, this would NOT send geysers shooting straight off the moon. The energy source for them is not known; there are several theories. As far as water flowing down the long crack in the surface, this is physically impossible. Liquid water would simultaneously freeze and boil . . . rapidly, since Enceladus has no meaningful atmosphere. And as for the billion dollars, we spend that every 2-3 days in Iraq; what a DEAL! I'll take the space mission ANY DAY. Wally is an idiot, Mr. Planetary Scientist. We have established that point. He'd much rather spend billions upon billions of dollars fighting wars than unraveling the mysteries of the universe. Personally, seeing all the amazing innovations from NASA spinoffs (read up on NASA's Spinoff Magazine) and knowing how they can affect our everyday lives as well as the general amazing knowledge acquired by space missions, I'd like to see NASA with a $50 billion USD budget a year. Enceladus is not digesting it's photons well. Ice is too thick for fishing. Some carbon, the black stuff, is needed to raise the temperature. Roll out the pool covers at night. Frozen is no paradise. 🙂 Wow, I got some nice feedback. I feel all warm inside. @Derek: Aye, the geological changes would take millions of years to see, but the geyser activity deserves closer study (hence my desire to orbit just that moon at less than the cost of a modest week of war). 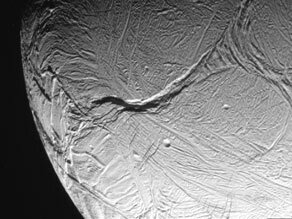 Also, we really don't know what parallels can be drawn between Europa and Enceladus unless we get better looks at them. And as Planetary Scientist pointed out, the liquid isn't exposed (although I believe sublimation is the correct term, not "boiling"). Again, the thing we need is further study. I know it's very tempting to draw conclusions that the data doesn't fully support (I have been guilty of it myself, but I reign in my enthusiasm upon further study). Let's hope the election sees a much more pro-science agenda for the future! We need a poll! Who here thinks that Franko is actually some sort of computer based personality that makes these posts to see if he can be mistaken for a human (Touring Test)? Oops, added an "o" in Turing... Need (limited) edit functions here! Larian: I didn't draw any parallels between Europa and Enceladus–that was another commenter. Thanks for the reply, though. By the way, I am not so sure it is a computer, but just a really drugged up human or perhaps one with an extreme mental illness. Or maybe it's just someone who gets a kick out of making ridiculous comments. Aussie Jane - "Tidal flexing"
Perhaps, the core bounces like a ball, imprisioned inside the ice crust. Out squirt the water and iceberg boulders. regular as clockwork ? Obviously a close up of the reporter's gonad wrapped in plastic. See a doctor you pervert. (They changed the gender of the their name to hide their shame). It's all there, look it up. thats the coolest thing ever!!!!!!!!!!!!!!! All this stuff is fake, done in an airplane hanger in Barstow, CA with Serran Wrap, pipe cleaners, and paper mache. All to justify a billion dollar budget that makes a handful of oberpaid bureaucrats and defense agencies super rich.